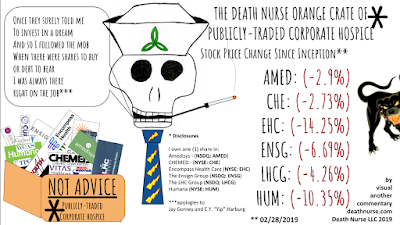 The sole purpose of the Death Nurse Orange Crate of Publicly-traded Corporate Hospice is to educate clinicians, caregivers, and the community about companies looking to make a profit from providing services to patients and families facing serious illness and end of life. Our first lesson is that the stock prices for all of the companies are lower at the end of the Orange Crate’s first month. The company posted an announcement in Facebook with the following message from CEO Paul Kusserow, “You’ve joined a nationwide team committed to the same principles of honoring life through excellent patient care that have made your company so successful - welcome to the family!" The language sounds like something from a brochure. The reasoning is unclear to me, but the thinking seems to be that buying other hospices is a way to get stronger and leads to taking care of more people (makes sense); “with purpose” means something that isn’t explained but is supposed to impress us; and will eventually make everything better for everybody in the country somehow sometime ("ultimately improve"). They also exude the singular confidence that by getting even bigger ("more scale"); imposing hierarchies, processes, and rules ("building structure"); adding bosses ("regional support"); getting laptops and/or smartphones and/or IT nerds and/or playing with data ("technology"); and making everyone watch webcasts ("professional development"); and by somehow doing all of this by “joining forces” (how?) with “other hospice companies” (who?). Encompass surprised watchers when it announced its plans to acquire privately-held Alacare Home Health & Hospice for $217.5M. That’s more than twice the amount the company previously told investors it planned to spend on its strategy of inorganic growth (i.e., to get bigger by buying other hospices). Also, too: Keep reading Generic Hospice Blog.